Also: Locals rally around Oakland artist Jasmine Infiniti after attack. Matthew Melton, shown here in 2015. If you always suspected that the garage-rock scene masked its conservatism with ostensibly “apolitical” lyrics about pizza and monogamy — prepare to feel justified. Castle Face Records severed ties with Matthew Melton this past week, after the songwriter and his wife and bandmate Doris criticized feminism and immigration in a recent interview. 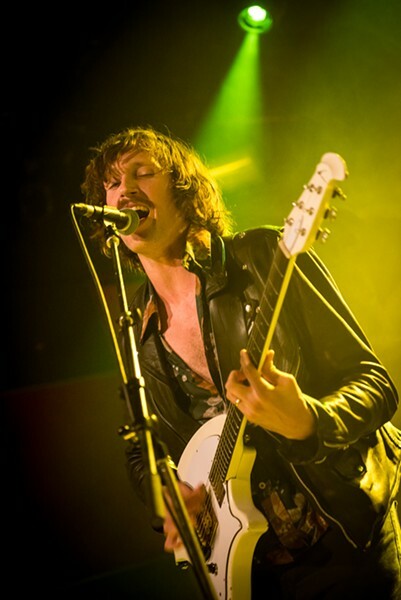 Formerly bandleader of Bay Area psych and garage rock groups including Bare Wires, Warm Soda, and Snakeflower 2, Matthew moved to Austin in 2014 and formed Dream Machine with Doris. Castle Face, founded by Thee Oh Sees bandleader John Dwyer, has released several records for Melton, most recently Dream Machine’s The Illusion. After widespread condemnation of the Meltons’ statements, however, Castle Face operators wrote that they’re “horrified and ashamed,” and vowed to donate profits from sales of The Illusion to charity. Castle Face’s decision to drop Dream Machine made the Meltons something of a cause célèbre for the far-right, drawing scorn from Proud Boys founder and avowed “western chauvinist” Gavin McInnes, who invited the couple onto his talk-show. To this columnist, who once played music with Matthew, the comments aren’t surprising. And the incident has prompted local artists to reflect on how the garage-rock scene cradles regressive politics by avoiding such discussion: nostalgia can veil resentment of multiculturalism, and romantic lyrics can hide a desire to subjugate. Supporters of Jasmine Infiniti are raising money for medical expenses after the Oakland artist was assaulted in an apparent hate-crime in New York earlier this month. Infiniti and London Jade were leaving a bar when approximately ten individuals hurled slurs at the artists, who are trans women, and then attacked — leaving Infiniti with a fractured jaw and Jade with a knife wound. New York police confirmed to Paper magazine that the incident is being investigated as a possible hate-crime. Co-founder of art collective New World Dysorder and fixture of recurring local parties such as Club Chai and Voltage Drop, Infiniti is an important part of music scenes that center transgender and queer people of color in Oakland. She was in Brooklyn to perform at a similarly minded party thrown by Discwoman. A YouCaring.com campaign seeks $50,000 to cover anticipated medical costs for Infiniti and Jade, and Friday, July 7, promises a benefit gig, thrown by Club Chai, at Mezzanine in San Francisco. One out of ten transgender people reported being attacked because of their gender identity in a 2015 survey conducted by GLAAD. According to the same organization, thirteen transgender women of color have been killed so far in 2017.